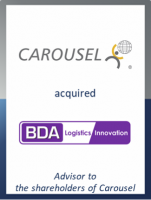 GCA Altium advised high-performance service logistics provider and Livingbridge portfolio company, Carousel Logistics Limited, on its refinancing and acquisition of time-critical logistics company BDA Logistics Innovation (BDA). Carousel provides specialist logistics solutions to high performance industries across Europe in the agriculture, med-tech, high-tech, scientific and automotive sectors plus other service-focused industries. Using its own market-leading technology platform, Gateway, Carousel’s clients have access to all available transport data from across their supply chain. By connecting its multinational, blue-chip clients to its flexible air and road network, Carousel ensures the reliable transportation of mission critical parts and products across Europe. Logistics provider BDA operates across mainland Europe, the UK and Ireland. The company has hubs in Birmingham, Frankfurt, Dublin and Maastricht and specialises in time-critical spare part supply chain solutions. The acquisition significantly expands the Carousel group’s European reach, growing the company by more than 50 per cent, and extending its service portfolio and transport lanes. The deal will strengthen the Company’s existing operations in Germany, Ireland and the UK, and extend operations to the Netherlands. The acquisition also continues to extend its European service and technology platform, Gateway, a major milestone for Carousel. Carousel Co-Founder and Group CEO, Graham Martin, said: “As the demand for service-logistics continues to grow, it is important that we provide the right technology, network and services that our clients need. With an impressive client portfolio and high service levels we have admired BDA for some time, particularly because they share our belief in delivering exceptional service solutions for situations. In coming together, we have completed a critical step in achieving our goal of becoming Europe’s leader for aftermarket solutions and technology."